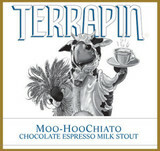 Like your favorite cup of Café Mocha, Moo-HooChiato “Chocolate Espresso Milk Stout “ puts you in the right state of mind. Take in the aroma of expertly roasted espresso from Jittery Joe’s and let your taste buds melt into the flavor of Olive and Sinclair’s award winning chocolate. Brewed with lactose sugar for a creamy mouth feel and a touch of sweetness, this is a Barista’s wish come true.